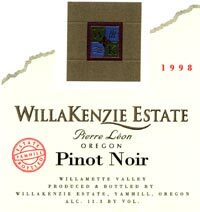 Profile: This relative newcomer on the Oregon wine scene is fast becoming recognized as a place for Pinot. From Pinot Blanc and Pinot Gris to Pinot Meunier and, of course, Pinot Noir, dedication to quality has already earned Willa Kenzie a place at the White House dinner table. Thanks to the supervision of Bernard Lacro�te, a Frenchman who learned to appreciate Pinot Noir almost as early as milk, we don't doubt that in time this winery can become a U.S. leader in Burgundian-style wines.